Want the Best Looking Home in Baltimore? Deck Maintenance can help! Over the last several weeks, we have examined the benefits of two different types of decking: wood decks and low maintenance decks. Both have their own unique benefits and choosing between the two can be difficult. It all comes down to personal preference. Which do you prefer? No matter which type of deck you choose, one thing is for sure. Deck Maintenance is in your future. Even low maintenance decking requires SOME maintenance. Low maintenance does not mean no maintenance, after all. Spring is in full swing here in Baltimore, Maryland. The sun is out, the birds are chirping, the flowers are in bloom, and the temperature is in the 70s. Aaaah! What could be better? Spring is the perfect time to get out in your yard and prepare your home for another hot and humid summer in Baltimore. And where better to start than your deck? Fortunately, low maintenance decks are exactly that, low maintenance. Vinyl and composite just needs to be cleaned from time to time. So remove any deck furniture and get to work. Sweep dirt and debris off the deck. Look for any signs of damage. If you spot something, have it repaired as soon as possible. Next, give your deck a nice thorough cleaning. Grab a power washer and get to work, spraying each board at approximately a 30 degree angle. Spray in the direction of the length of the plank, not across or surface. For pesky messes, a cleaner may be needed. Be sure to check manufacturer recommendations. While wood decks may require a bit more maintenance than their vinyl or composite counterparts, nothing quite looks as good as wood. The added aesthetic appeal is worth the extra work. So, once again, remove any deck furniture and get to work. Once again, you can use a power washer to clean your deck. Just be sure to keep the pressure low and keep the stream moving to avoid damaging the wood. Next comes the time consuming part: staining. Unlike low maintenance decking, wood is vulnerable to moisture and requires annual staining. Choose a color you like and get to start staining your deck. You can use transparent stains to show off the natural color of the deck or solid stains to protect against harmful UV rays produced by the Sun. Don’t have a deck? Want a deck? Freedom Fence and Home can help! 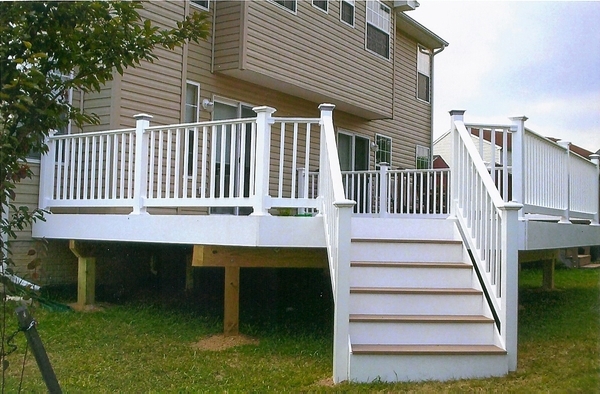 Freedom Fence and Home provides excellent deck constructions services all over Baltimore and Harford counties. Our crews are experienced, knowledgeable, and high skilled, ensuring each deck we build is properly installed to meet your expectations. Every wood deck we build comes with a 5-year limited warranty on workmanship and material. If you have any questions about Deck Maintenance in Baltimore, please contact Freedom Fence and Home by calling 443-271-6841 or visit our website. You can also follow us on Facebook and Twitter! This entry was posted on Tuesday, May 13th, 2014	at 7:04 pm	. Both comments and pings are currently closed.